It is a universal truth that once a woman becomes a mother, her world just changes completely. She becomes all the more emotional and a lot more responsible than what she really was before having a baby. Of all the things that change, what majorly changes is how she bonds and lives with her husband. One may find it difficult to understand her situation, but it is extremely overwhelming to have a baby to look after, and a husband who also wants his emotional needs met from one single person. Such distances often lead to friction if not handled well can lead to disastrous results. New dads need to understand the situation and help their women take their time to sort things for themselves. It is important for Dads to know about caring for your wife after the baby is born. Sometimes, this friction can be minimized if the husband takes certain steps during pregnancy itself. Participating during pregnancy, labor and delivery help bring the couple closer. For tips on how to take care of your pregnant wife, click on the link in blue. The article written by Sitaram Bhartia Hospital in Delhi provides expert advice for every expecting father. We have all heard about the 40-45 days that most cultures recommend moms to be on rest. That also has a scientific backing that it does take almost those many days, or 6 weeks if you must call it, for a mother’s body to calm down a bit. Why calm down? Because there is a hormonal whirlwind going on inside her and all she needs at that time is a concoction of understanding, affection, and care. But often, couples see a discord between themselves after the baby has arrived. These factors may directly or indirectly affect the relationship of moms with their spouses. So how can dads participate in taking better care of their wives after they have delivered a baby? Let’s accept it – science may say it takes 45 days or 6 weeks, but in reality, it takes as long as it takes. Every person has a different strategy for coping up with their postpartum issues and may take their own time to get a hang of their life again. This is also pretty much dependent on the amount and the level of help available to the mother. 1. If she looks at the baby through the night, build up courtesy to take care of the baby in the morning. When the baby needs to be held and fed in the morning, volunteer to take care of it and let your wife sleep in for some more time. 2. If your partner is nursing the baby, be helpful if you are around. Fetch her something if they want. Avoid the urge to hush them into completing the session soon. 3. If the baby sleeps, the baby sleeps. Avoid the urge of wanting to wake it up, and coochie-cooing them. We agree, they seem most adorable when they are sleeping. However, it is important to remember that your wife could get immense stress because of a wailing and cranky baby that woke up from their sleep. 4. If your wife is a bundle of jumbled emotions, try to be the sorted one. Calm down and listen to her. She may be excessively complaining, or may not even have a ‘logical’ problem on some days, but be tolerant. Your partner is probably not in the best shape of her life, let it go. 5. Look around the house and see how you can participate. Even better, ask your spouse if she needs help with something. With a baby in the house, the chores mushroom multifold. Helping your wife when you are home is one of the ways of caring for your wife after the baby. Wash nappies, put them out to dry or fold them. Don’t get irked by poop and sometimes clean the baby too! Fix a good snack for your wife, offer to hold the baby while she can just sit for a few minutes. Clean bottles, sterilize them, or just put other things at home in order. With a little one at home, one can never get enough done. Try to participate and help your spouse with all the little big things. 6. Practice speaking in a low voice. The baby may be trying to nap, or maybe napping already. A regular, loud voice may disturb the baby. Same goes for the TV and mobile phone volumes as well. 7. Let the mommy put the child first, but as a rule of the thumb, you should put your wife first. I know it seems unrealistic right now, but not everyone’s focus should be on the child. The mom is already in despair and all that she needs and requires right now is you. So while she is quite capable of taking care of the child, a little caring for your wife after the baby can go a long way. 8. If she has been into a job before but is not financially independent anymore, consider giving her a certain pocket money every month. She may or may not spend it, but it will keep her less bothered of the ‘losses’ in her life. Money is a huge motivator, and whether you accept it or not, her job and her career are equally magnanimous to her. If you liked the points shared here, do SHARE this blog with expecting parents, or parents who have just welcomed their little bundle of joy! Being a father should never be an excuse to exclude you from the beauty of parenting your little one. 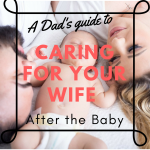 It is crucial to remember that in these changing times where both partners play a crucial role in responsibilities within and outside the home, caring for your wife after the baby is just as important. You may also like to read Tips on how to control your anger and stop yelling at your kids. If you liked reading this blog, do SHARE it with your friends. Do tell me if you would like to add something to the list of ideas I have shared above. Wife to one, Mom to two and a friend to a hundred. Good, bad, awesome and horrible, all in one! Been through depression myself, I value the power of Entertainment and HUmor in our everyday life. That is why i choose to write about lighter, fun topics more than all the difficulties I went through! I'm Crazy Mom of Twin Boys, my TWINADOES - Chirag and Chitransh ...! Together we learn new things and explore new meltdown points of each other... I don't look for friends anymore, for I have personally given birth to my monster partners of Crime!!! A trained Counseling Psychologist by qualification, I am now a Quirky SAHM and a Creative Content Writer, whose world revolves around an awesome husband and 2 ruckus makers. I feel emotional support as you have mentioned is very important. New moms can have really complex feelings from the stress of coping up with motherhood itself. Parenthood can be enjoyed to the maximum if both the partners contribute equally. These days with increasing nuclear families husbands often participate more than the males of earlier generation. While we learnt this through trial and error having these tips before hand will be so helpful to all couples. Life become more easy if father helps in little little things.. And Parenthood become more enjoyable.. Parenting right from the start has to be a collective affair. No chores can be gotten rid of. I’m lucky my husband helped me out a lot, both times. This is a great post for new fathers. Wow those are some wonderful tips. My hubby showed great emotional support when I needed it the most. Thanks for the lovely post. I second your thoughts. Every things go smoothly both the parents help each other. Parenting journey will be smoother when both the partner contribute equally. Very nice tips you have mentioned here..
Those are some very helpful tips you have shared with us. Absolutely agree with you but I personally think no.6 speaking in a low voice is very important. By the way I am really very lucky my husband helped me a lot during my post pragncy. Definitely all these points are important… Especially when the child becomes priority… They have to understand this. I will make sure my husband reads this carefully before we plan for a baby. Parenting goals need to be with both parents combined. Support from better half post baby is very crucial and gives positive strength to a woman. Lovely topic.